Proteinosomes are a new type of synthetic protocell that are delineated by a semi-permeable, stimulus-responsive, enzymatically active, elastic membrane consisting of a closely packed monolayer of conjugated protein–polymer building blocks. The proteinosomes can be dispersed in oil or water, thermally cycled to temperatures of 70°C, and partially dried and re-inflated without loss of structural integrity. As a consequence, they exhibit protocellular properties such as guest molecule encapsulation, selective permeability, gene-directed protein synthesis and membrane-gated internalized enzyme catalysis. 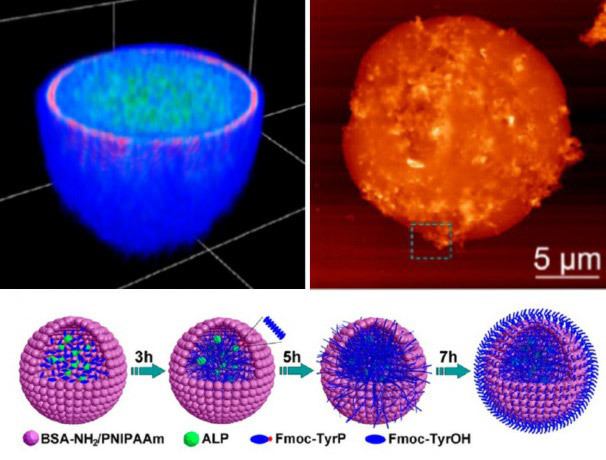 We are interested in preparing proteinosomes from amphiphilic protein–polymer conjugates that exhibit temperature-responsive properties and display self-assembly behaviour at water droplet/oil interfaces. We are using these novel micro-compartments for the gating of enzyme reactions located within the picolitre volume of the proteinosome interior. 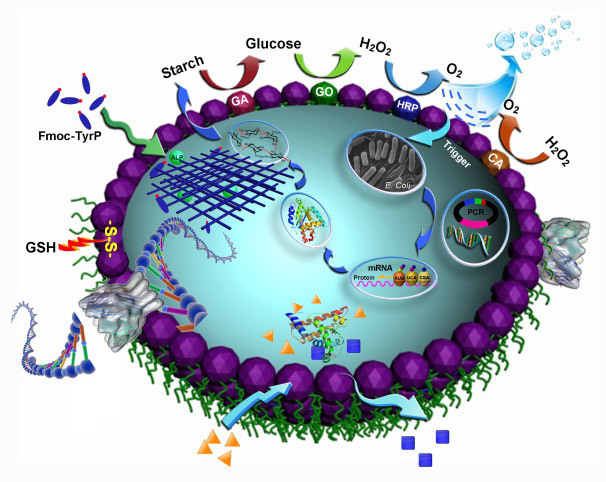 We are also interested in constructing smart proteinosomes that comprise a triad of enzyme–polymer amphiphilic building blocks capable of operating together as a multi-step membrane-mediated cascade system. In other work, we are exploring the design and construction of a cytoskeletal-like matrix by enzyme-mediated formation of an amino acid hydrogel within the interior of the proteinosomes to increase mechanical robustness and generate a molecularly crowded reaction environment. 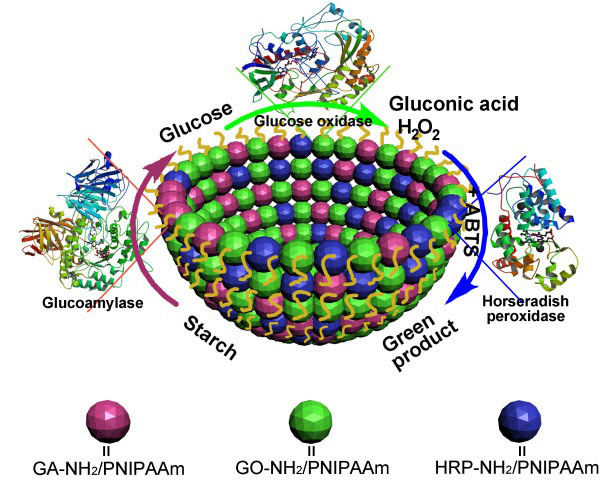 Prolonged growth of the encapsulated hydrogel results in penetration of the amino acid nanofilaments through the porous shell of the proteinosome to produce a continuous, protease-resistant outer wall that totally encloses the protein–polymer membrane, analogous in some respects to the cell wall/cell membrane layered structure of bacterial cells. Xin Huang, Avinash Patil, Mei Li, Stephen Mann, JACS 2014, DOI: 10.1021/ja504213m. Mei Li, Xin Huang, T.-Y. Dora Tang and Stephen Mann, Curr. Opin. Chem. Biol., 2014, 22, 1-11. 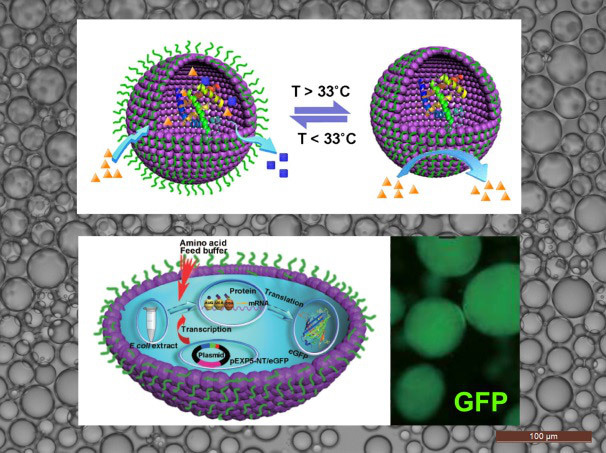 We are also exploring multifunctional proteinosome-based protocells with the potential of integrating aspects of supramolecular and polymer chemistry into the design and construction of novel bioinspired microcompartments as a step toward small-scale materials systems based on synthetic cellularity.